Adept Restoration Services has over 40 years experience in cleaning and sealing modern and heritage buildings. 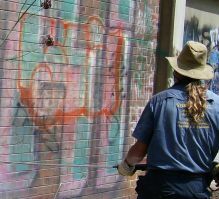 Graffiti removal, sandstone cleaning, Heritage cleaning, fire and smoke damage cleaning and insurance work.
" Thank you Bruce Goddard, and to your team for an outstanding job. My wife and I cannot believe the transformation in the place and its surrounds. It is like when we moved in some 4 years ago. A truly remarkable and terrific job! I will ensure I pencil your company in for more regular cleans and maintenance." "This is the best steamcleaning job & one of the few carried out correctly that I have seen in Australia since I returned from England where I supervised the cleaning & repairs to major stone buildings." 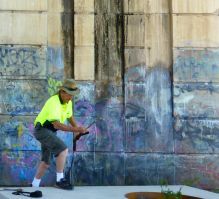 - Nicola Ashurst,2016, leading Heritage architect referring to the cleaning & sealing of Lennox Bridge, Australian mainland's oldest stone bridge, Old Bathurst Rd Glenbrook, Blue Mountains National Park."